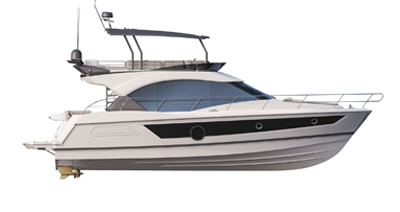 The Ombrine 960 is a real character : forget the usual run of the mill motorboat, this fast cruising launch, an evolution of the famous Ombrine 900, will captivate you with son undeniably classic charm : smart fast hull lines, yacht-style hatches an fixed glass windscreen or, an optional semi-open GRP wheelhousse. Also adding to her personality, the "Nantucket"version sports a navy blue hull, mahogany joinery an teak cockpit ! The Ombrine 960 : a contemporary cliassic of its time, this magnificen launch will fulfil your desire for fishing, lazin around or cruising ... and for a very long time.